"I am angry at the archaeologists and I want to beat them"
A cautious but upbeat assessment of the Ancient Coin Collectors Guild and its impact on people outside the coin collecting hobby who would demand certain coins be returned to their place of origin due to their being cultural patrimony was given Jan. 12 at a meeting of the ACCG during the New York International Numismatic Convention. Coin dealer Harlan Berk of Chicago recently supported the educational grants effort by contributing ancient coins to be used as learning tools in the schools. Berk said he was told an archaeologist told a school teacher it was a bad thing to give ancient coins to children. Speaking at the NYINC meeting Berk said, "I am angry at the archaeologists and I want to beat them." Attic Red-Figure Close to the Proto-Panaitian Group and the Carpenter Painter, ca. 510-500 B.C. The Carpenter painter painted in Athens in the last decade of the 6th century B.C. As with most vase painters, the true name of the painter is unknown. The Carpenter Painter gets his name from his depiction of a carpenter at work, which is now in the British Museum. The Carpenter Painter was familiar with the work of the Pioneers and particularly influenced by Euthymides. In the center of the tondo is rendered a delicately painted reveler, a komast, holding a flute case, with the words "PA [N] AITIO [S K] ALOS, and PANA [ITIOS] KALO [S]", written around, praising the beauty of a youth named Panaitios. On the reverse of one of the fragments are two wonderful pot-bellied komasts, with the main figure holding up a staff that hides his face but shows off nicely his fat round belly. On the underside of another piece are the legs of two figures, but what should be pointed out is the finely drawn hand lightly holding a staff between them. Not shown are two partial pieces of either handle, which come with the group of fragments. An important piece for any collector of Athenian vase painting. H. 8 1/2". First, I looked under Proto Panaetian. There is a fragmentary cup there showing a youth at a symposium with Panaitios kalos.The same kalos name appears on a cup from Chiusi showing a satyr riding a wineskin (Baltimore, Walters Art Gallery), and on a cup from Gela (Sicily) showing a youth with an oinchoe. A very fragmentary cup, showing warriors in fight scenes, also names Panaitios; this formed part of the collection of the late Dietrich von Bothmer. A fragment with Panaitios kalos was also found on the Athenian Acropolis. Second, I looked under the Carpenter painter. 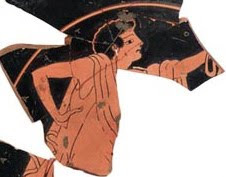 I note that cups attributed to this painter (or close to him / her) have been found at several sites in Italy (Cerveteri, Chiusi, Orvieto, Spina) and also in Greece (Athenian Acropolis, Corinth). Third, I searched under the Panaitios kalos name. Cups with this kalos name have been found near Viterbo, and at Cerveteri (four), Chiusi, Orvieto, Vulci (three); one was discovered at Gela (Sicily). One fragment was recovered from the Athenian Acropolis. There was also a cup fragment in the Dietrich von Bothmer collection with Panaitios kalos. Fourth, I looked for dealers in Chicago but Harlan J. Berk was not listed. There are some questions that would be worth asking about this apparently newly surfaced cup. Has the cup been published or recorded prior to its appearance here? I note that the main part of the cup has been restored and that that there are further fragments. Who was the restorer? It is claimed that this newly surfaced cup is "an important piece". However its findspot is apparently unknown and unrecorded. This is a pity as it could have told us something of the distribution of this type of pottery in the late archaic period. Detail of Attic red-figured cup offered by Harlan J. Berk, Ltd. I did a search for RED-FIGURE and *AITI* in inscription and got 37 hits, most of which are not it, to judge from either the images or the full description. The first and the last few are vague enough to possibly be it, but I doubt it.